So what is the best floor drill press on the market today? That’s exactly what we aim to find out with this ultimate guide. 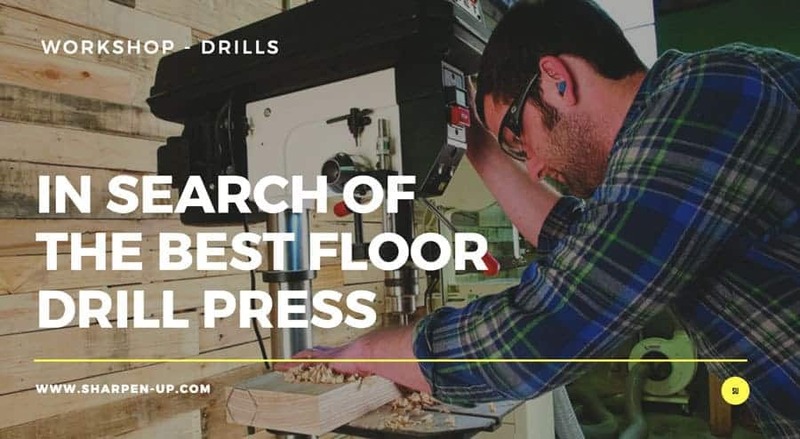 We have gone in depth here and brought together 5 comprehensive reviews of some of the best floor drill presses available today. To view our results at a glance just see the table below. For our comprehensive buyer’s guide and full reviews of each of our top rated picks, keep on reading. 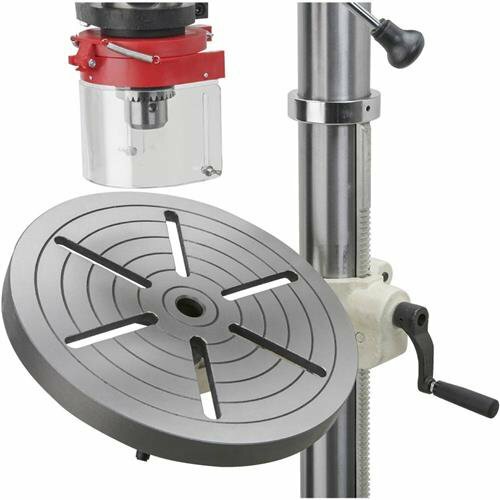 Drill presses come in four main types; the bench-top model, the generally more powerful floor-standing model, there’s also the magnetic model and the radial model. The main differences between each are affordability, power capacity and portability. 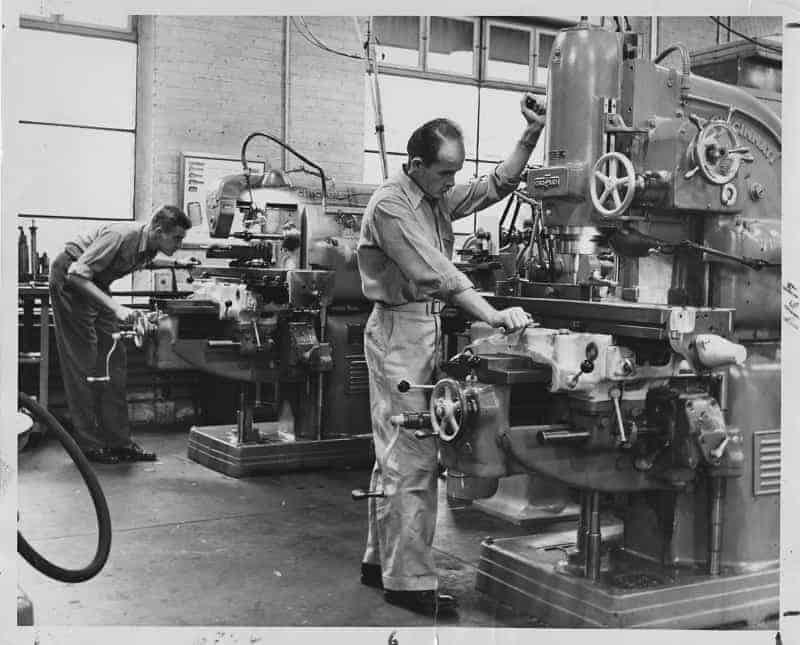 And while a comparison of each type of drill press is outside the scope of our article today; to find this page in the first place means you are interested in the floor drill press. That’s what we will be focusing on here. 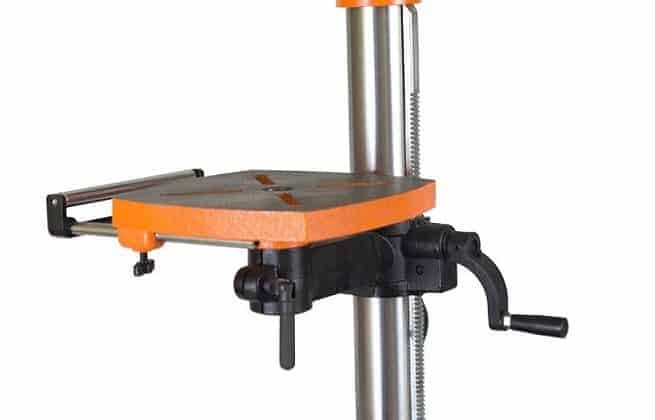 If you are on the lookout for a powerful drill press with a wide array of available accessories (and are not so worried about portability), the floor-standing model is the way to go. 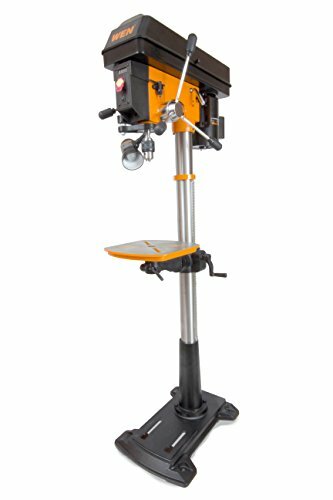 The floor drill press is ideal if you need to carry out large projects and/or manufacturing jobs within your workshop, (be it a home shop or professional). The fact they are installed directly on the floor provides better stability and robustness; necessary factors when dealing with larger projects. 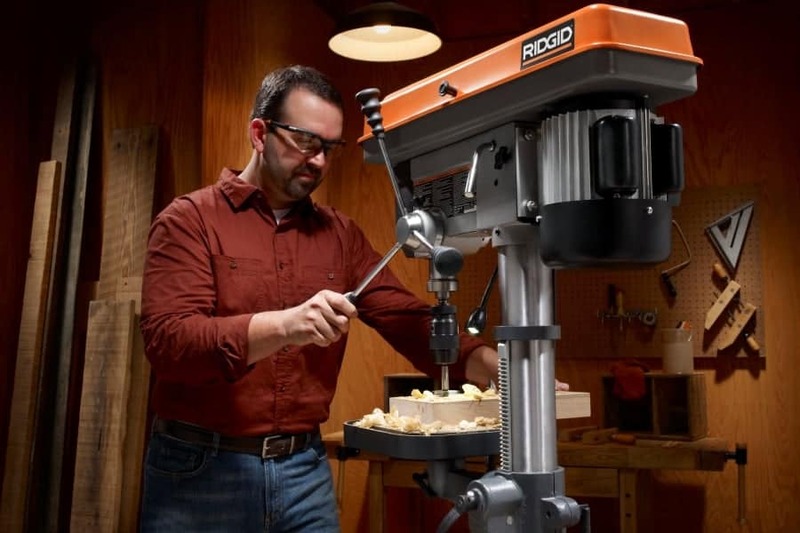 A floor drill press will generally offer 14-20 inch swing capability, with up to 16 speed levels to boot. Again, this is a level of precision performance and versatility that cannot be achieved with the average bench top drill press. The power and precision that you can achieve with a floor drill press provides a huge amount of benefits over a standard drill. 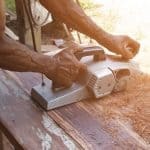 Precision Control – We’ve already mentioned one of the main benefits, and that comes down to precision – A drill press allows you to drill at very precise angles. Repeat accuracy – Repetition is a key factor too; once you have set your tool it is possible to drill holes of identical depth, size and position. Variable speed – most floor drill presses can alter their spindle speed via a variable speed motor, as well as moving the belt across a stepped pulley system. 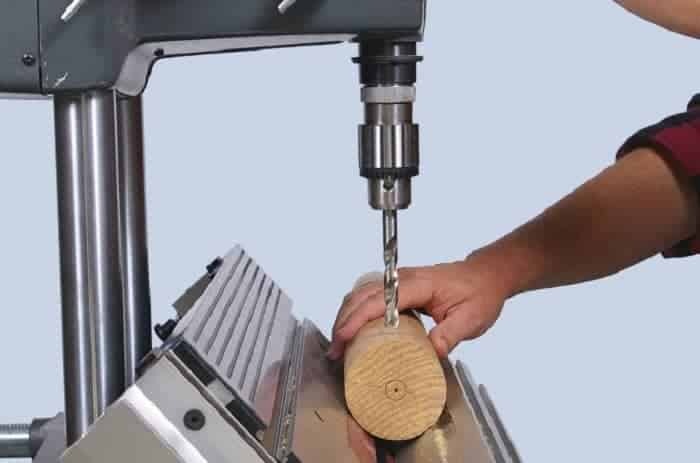 Efficient operation – A floor drill press takes the effort out of the work because of the natural leverage achieved by using the lever to pull the spindle towards the material. 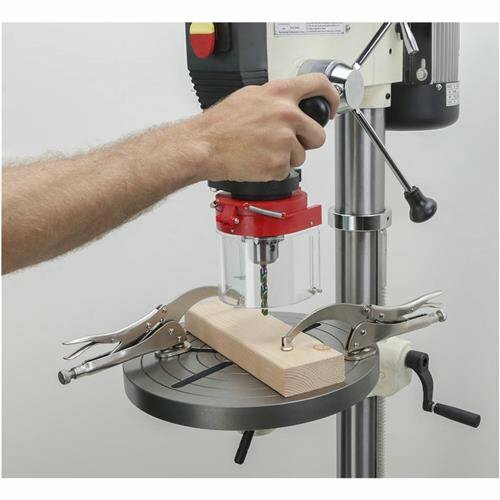 Versatility – A floor drill press can also be used for a wide variety of workshop tasks. Rotating accessories can be attached to the tool to help with polishing, honing, or sanding. Excellent for woodwork – Floor drill presses are a favourite with woodworkers as they make drilling into wood easy and accurate. Safety – The drill bit is fixed securely, as is the work material when clamped in place. This ensures a level of safety when compared to a standard hand drill. When in the market for buying the best drill press there are few factors you need to keep in mind. You will want the tool of choice to have the power and features necessary for the work that you wish to carry out. Look for a machine that has a robust construction throughout. Not just the body of the drill, but the components too. Opt for a cast iron head if possible. This is a tool you will want to last for years. Look out for a chuck that is taper-mounted. This will help ensure greater accuracy as well as eliminate run-out. You should also go for a chuck that can be easily tightened with a wrench or key. Another nice feature that some drill presses incorporate is the self-ejecting key. This ensures that the key is not left in the chuck during operation. Finally the chuck should have ½ inch capacity so that various bits and accessories can be used with the press. Obviously the more advanced and powerful machine you can afford, the better. This will give you more versatility as your demands potentially grow. The drill press should also feature an adjustable motor bracket support. This should be sturdily constructed so that the machine is held in place securely. It will also prevent damage occurring to this vital component. You should opt for a floor drill press with the capability to offer a selection of speeds. This will widen the range of materials you can drill. (For instance, drilling wood will require different speed settings to drilling glass or ceramics). Some drills will have up to 12 different speeds: 250 rpm will be on the low end, with a maximum speed as much as 3,000 rpms available. Ideally the table and base will be ribbed for added robustness. Slats or ledges should also be present on the sides of the table. These will be used for clamping work. A ground flat table is required in order for accurate work. Further precision can be achieved if the table adjustments are easy to use. You need a fluidity of movement for positioning the table along the various axis. The depth-adjustment gauge will allow you to drill holes of the same depth over and over again. This aspect of the machine needs to be well built and reliably accurate, (industry and user reviews will help ascertain this before you buy). 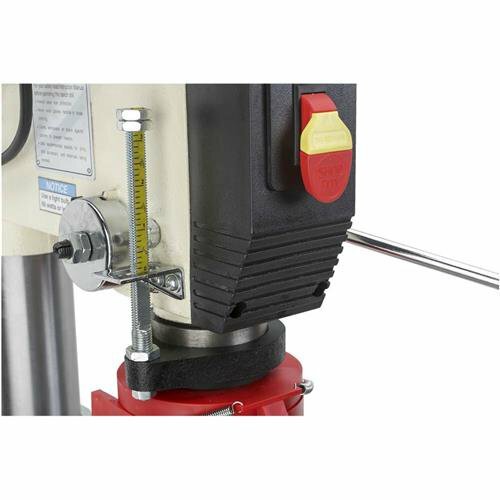 We mentioned the range of accessories that can be used on a floor drill press on the benefits sections above. The fact is, a machine that offers a number of additional features and accessories will definitely be the best option to buy. 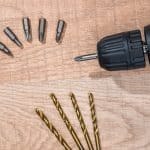 Ideally, these accessories will be manufactured by the same company as your drill press so that compatibility issues do not become a problem for you. When buying a tool that you want to last for years, (and grow with your demands), you really shouldn’t scrimp if you can. By paying extra for a reliable, quality brand will pay dividends over the long term. Make a note of the type of warranty and service support you can expect too. You should also ensure that proper replacement parts are readily available for when the time comes. 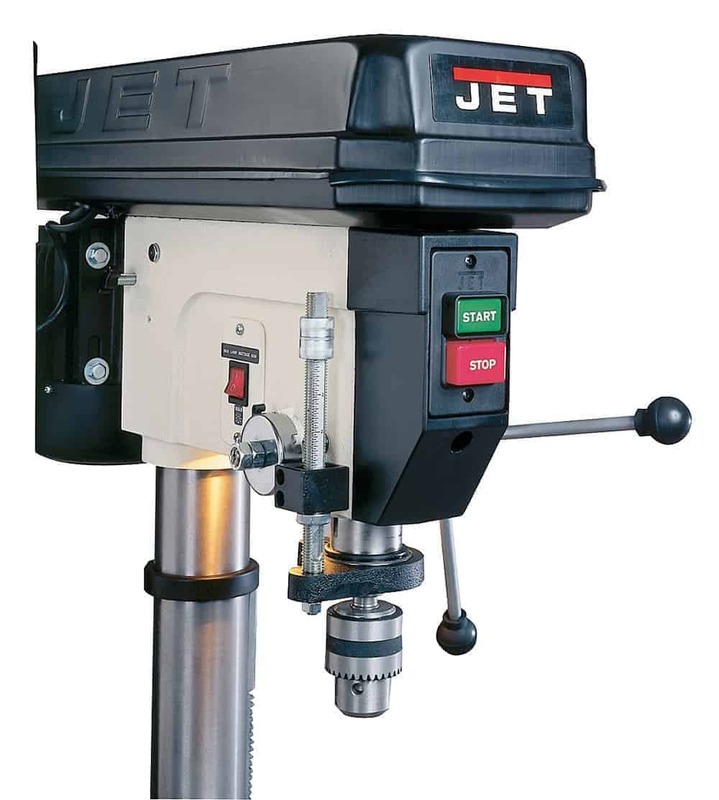 Our top pick floor drill press this year is the Jet 354170/JDP-20MF 20 inch. 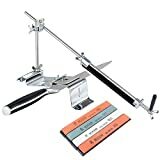 The machine balances top notch performance with great versatility, all in one package designed for professionals as well as the home workshop. Under the hood Jet have opted for a powerful 1.5 horsepower engine, (it is pre-wired for 115-volt outlets but also can be adjusted to run off 230-volt sources). The Jet is capable of a very impressive 12 individual spindle speeds. The range available is a real selling point here. On the low end we have the capacity for 150rpms. This goes right up to 4200rpm at the fastest setting. Changing the speed is nice and easy. The operator simply flips back a hinged metal cover to reveal the belt. Place this onto the appropriate pulley for the speed you require and away you go. For repeat precision drilling the Jet 354170 has a 1/2-inch diameter external positive depth stop. This features a three-nut locking mechanism that provides surprisingly fast adjustment. The machine also features an adjustable tension spindle return spring. For extra durability (and with that reliability) the spindle is supported by high-quality ball bearings. 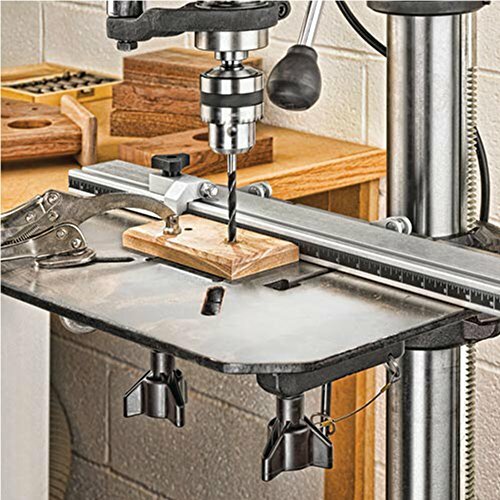 The drill press has the capacity for bits up to 3/4 of an inch, meaning a wide range of accessories are also compatible. The table on the Jet 354170 is another reason this floor drill press received our number one review. Just a slight movement on the crank will see the smooth-travelling system raise and lower to the needs of the job in hand. 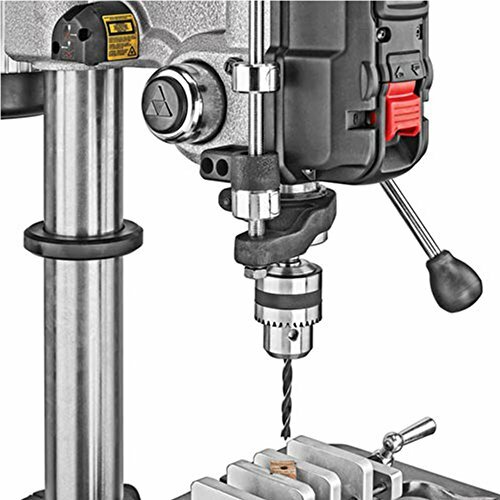 Angled drilling is simple to carry out with the rotating, 45-degree tilting worktable. A quick-release clamp is also included. Other features include an easy to reach on/off switch located on the drill press head, and a built-in work lamp. (For some reason the bulb is not included which does seem a little stingy). Jet also back their product with a competitive two-year limited warranty. Some users have raised the issue that the depth stop adjustment is not cast into the head. Also, some users have complained that the belt tensioning mechanism can be awkward to operate. 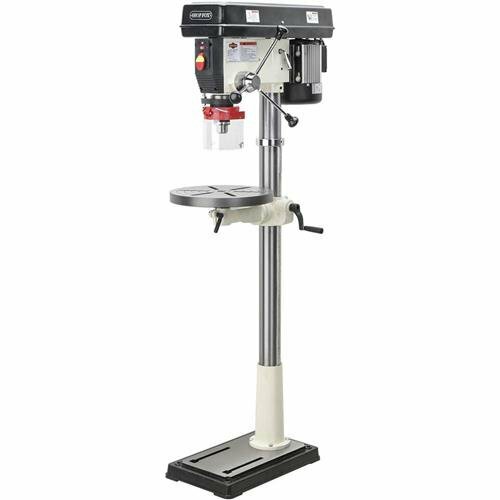 Overall, the Jet 354170/JDP-20MF is a high quality floor standing drill press that will meet a woodworkers needs whether it be at home or the professional workshop. It has the build quality, attention to detail and level of features to put it above the competition at this price range. Highly recommended. The Shop Fox W1680 is a suitable choice for those that do not need the power and drill capacity of our number one choice Jet. Designed for types of jobs one would conduct in a cabinet shop or small home workshop, the manufacturers have opted for a cool-running 1 HP aluminium finned motor. The Shop Fox is variable speed of course. Settings between 140 to 3050 rpms can be selected. That’s a bottom end capacity that actually beats our number 1 Jet. For a machine of this size, the top end coming in at over 3000rpm is a definite plus. The spindle features a #3 Morse Taper along with larger direct mount bits. Add that to the closely spaced spindle shaft bearings and you have what Shop Fox claim to be one of the most accurate floor standing drill presses in its class. There’s no scrimping on the build quality either. A solid cast iron construction has been used for a number of components; the 14 inch diameter tilting table is also precision ground. This can be adjusted for height, rotation and angle (from 90 to 0 degrees) depending upon the needs of the job. In total the Shop Fox W1680 offers a 31-1/2-inch maximum drilling depth from chuck to table, which is an extremely versatile spec for the home workshop. To ensure solid performance the machine features sealed ball bearings and rubber coated quick-adjust handles. There’s also some nice safety features on the Shop Fox W1680. The design includes a chuck guard to help ensure that there is no accidental contact with moving parts or flying debri. (This is spring loaded and can be flipped out of the way for tool changes). The oversize paddle switch is a safer option that a normal on and off switch as this can be easily accessed in an emergency. Approx. shipping weight: 220 lbs. Good travel on the spindle with the capacity coming in at 3-1/4 inch. The Shop Fox W1680 will suit those looking for moderate, mid range drilling capacity for the home workshop. It’s not going to be a tool that grows with you however. That being said, the features ad versatility that it provides for a drill press at this level make it a recommended option. 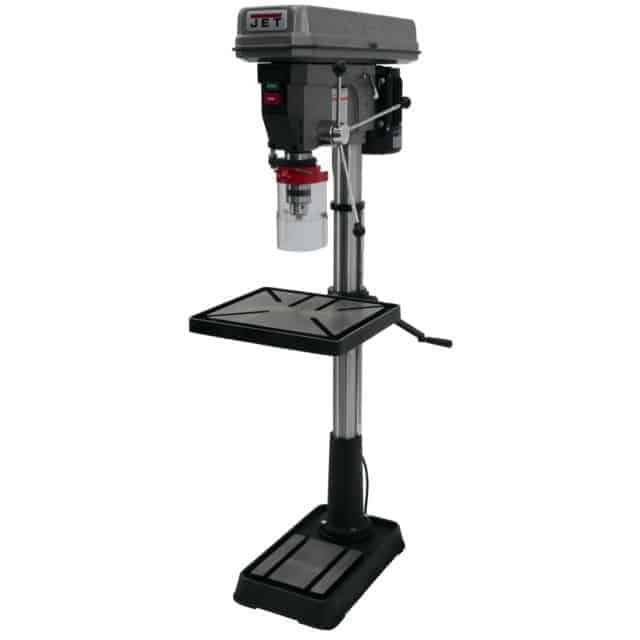 The WEN 15-inch floor drill press is another viable option for the home workshop for those that can work with a 15 inch swing. 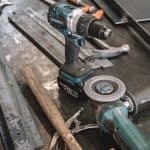 Much like the Shop Fox floor drill press reviewed above, it is not a tool that will be able to grow with you as your jobs potentially increase in size and demands. Under the hood is a 8.6 amp motor. This powers the variable speed spindle that actually has some impressive versatility. RPMs between 280 and 1000 can be accessed and changed with a simple turn of a lever. To take the rpms even higher it is just a case of making a quick belt adjustment – after that you have variable speed from 1000 to 3300 rpms. To keep you on track with the work that you are doing and the speed you are drilling, the WEN comes complete with a digital readout that displays the current RPM. The manufacturers have designed the model so that a full four inches of stroke capacity is available to the user. The 12-inch by 12-inch cast iron table is a well constructed component. Position adjustment is easy to carry out, with a pivot system of 45 degrees in both directions. Furthermore, there is a built in laser pointer to enable you to line up precise holes. As you would expect from a floor standing drill press, the base and frame is made from cast iron. Vibrations throughout the machine are kept to a minimum. You’ll have a damn hard job tipping the unit over too. A lamp to illuminate the worktable is provided as standard. There is also a nice little onboard storage utility to house the chuck key ready for use. To top it all off WEN include a competitive 2 year warranty. The company provides a customer service line for assistance, and they also have a nationwide network of skilled technicians waiting to help should you need assistance. The fact the WEN is a lower priced machine when compared to the others in our list is evident in the overall construction. It is not built to the same high specifications and this has been issue for a number of customers. For its size the WEN 15 inch floor drill press is an impressive machine. 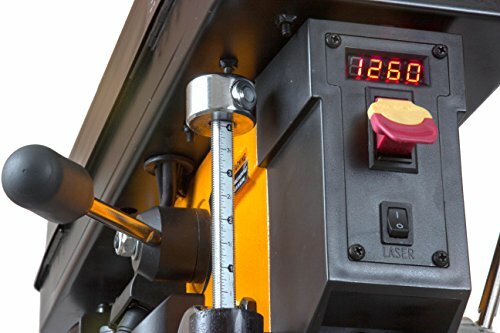 Features such as the easy to use variable speed selection, large stroke capacity and precision laser really do amount to a tool that punches above its weight. However, the construction is of a lower quality when compared to our other choices. That, along with the 15 inch swing and lower power motor means you should consider your working requirements before you buy. From the mid-range power but quality features of the WEN, we go to all round ruggedness of the Delta 18-900L. This is a drill press that means business. 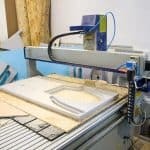 Ideal for woodworking projects across the board, the machine is versatile enough to work in the home shop or professional use. With a full 6-inch quill stroke, the Delta 18-900L boasts a very deep drilling capacity for a tool of this price range. This depth makes industrial application possible. While the 3/5 horsepower motor might not be powerful enough for some users, the fact it is running an auto-tensioning belt drive system, does make variable speeds use simple with the Delta. 16 speeds can be selected in order to efficiently drill through various types of material. The 18-900L also features micro-adjustable depth stops. The independent depth scale is useful in that repetitive drills can be set up with ease. 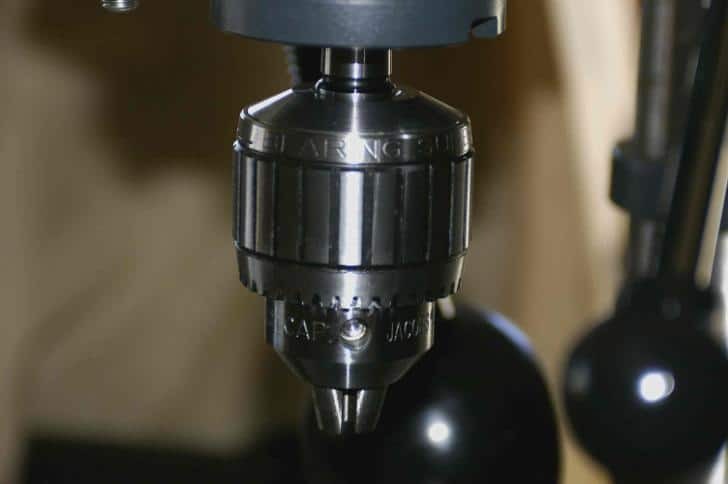 Precision drilling is simplified via the use of a twin laser mark up guidance system. A LED light is also fitted onto the machine and can be used to illuminate the work surface in low light conditions. Further control is obtained with the work table, rack-and-pinion height adjustment. Locking levers allow for easy angle adjustments. One real plus point is the fact the surface area is oversized on the woodworker’s table. This features a patented design and is able to bevel 0-90 degrees left and right. The tilt action is also good with a forward range between 0-48 degrees available. The unit has convenient to use T-slots for clamping materials, there is also a removable/replaceable center insert for through table drilling. Not scrimping on materials, Delta have made a solid machine too. 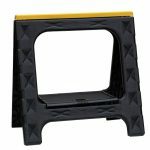 The 18-900L is built to last, the non-tip cast iron base providing maximum stability as you work. To top it all off, the DELTA 18-900L floor standing drill press comes complete with an extremely generous five-year warranty. 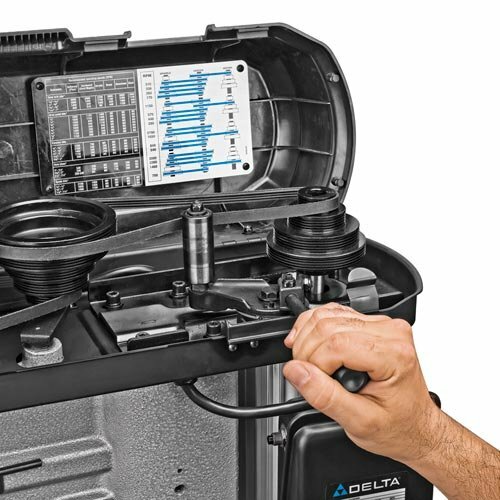 Despite the fact the Delta is designed to be a robust enough machine for professional use, some users have experienced issues with the overall build quality. 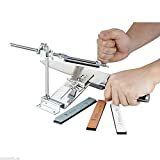 Add that to occasions of lacklustre support, (one customer on Amazon has actually complained that they provided used parts during a warranty fix), does put question marks on whether this is the drill press to buy. The final machine in our floor drill press review round up is the PM2800B from Powermatic. Like the Delta above, this up to 6 inches of quilt travel for the heavy duty deep drilling. There’s some nice design additions with this tool too. The mechanical variable speed system means there is no need to be fiddling with belt changes to achieve the different RPMs, (this is an issue that users of both the WEN and the Shop Fox have had). Powermatic have provided a digital RPM readout with the PM2800B. This of course allows the user to control the speed to a much higher degree of accuracy for the job in hand. 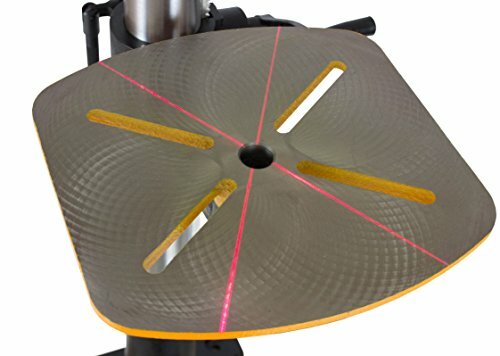 Keeping on the subject of precision and accuracy, the tool also has a laser mark up guidance system that sends beams across the work surface. For repetitive drilling tasks there is the adjustable stop. A built in fence system held at 90 degrees to the table is used for alignment of work material. The work table itself can also be rotated to a full 90 degree position. The unit ships with a replaceable square table insert which is held flush with the top of the table. For added illumination in dim workshop conditions, the drill features two independently adjustable LED lights. The overall robustness of design is no more evident in the oversized cast iron base. Some customers have complained that the travel on the RPM change wheel is too long. 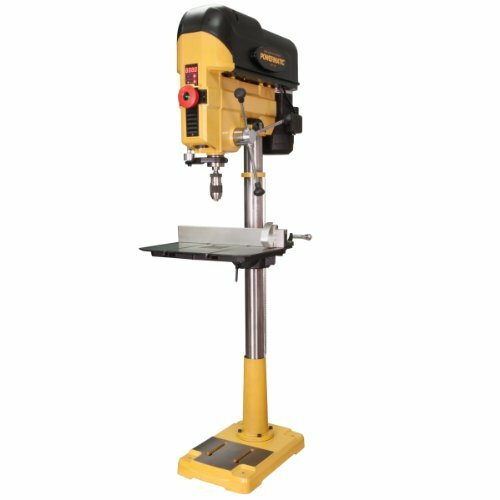 Overall the Powermatic PM2800B is a well built floor standing drill press with a lot of great features. It has the power and functionality to accommodate a wide range of shop tasks, and the mechanical speed variation is a real plus point too. Highly recommended. For those that want more information on the various components that make up a conventional floor standing drill press, we will take a more in depth look now. Some of these details will go over what we discussed in the buyer’s guide, however for the sake of clarity we feel it is important to take each section one by one all the same. The base is the section that supports the machine and can be mounted to the floor. The column is the vertical part of the machine that links everything together. The table is the section where the work material is held ready for cutting. The head contains the motor and the spindle. The base will be weighted and made as robustly as possible. It may also have pre-drilled holes so that the tool can be fastened to the floor. The column will often be made of durable hollow steel. All types of drill press will feature a column, however the length does vary. The table is clamped to the column. As described above, the table position can be altered to better accommodate the job in hand. (For example some models will allow the table to be tilted right or left. Other, more budget orientated models will feature fixed position only). The table may also feature slots that enable for the clamping of materials in preparation for drilling. The head on a drill press is where all the action is. The spindle revolves in a vertical position on the end of a sleeve that is called the quill. The quill and spindle moved downwards via a rack-and-pinion gearing system. This is operated by the user when they pull down on the feed lever. One of the great features of a drill press is the fact you can preset the depth to which the quill can travel. This provides accurate, repeat results. As mentioned in the buyer’s guide, you should ensure your chosen drill press has a 1/2 inch capacity geared chuck with a key. (This is the best size for the widest range of accessories). The spindle gets its power from the motor and is driven by a stepped-cone pulley or V-belt connection system. Speeds for floor standing drill presses generally range between 250 and 3,000rpms. However, some top end brands will stretch to over 4000. A motor between 1/4 or 3/4 horsepower is what you should aim for. 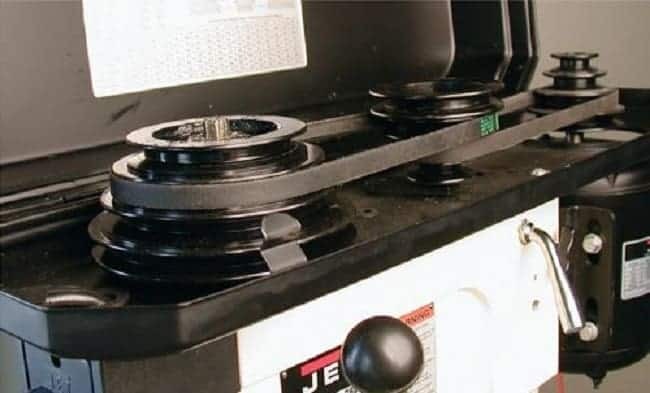 When manufacturers state the capacity or size of the drill press they are talking about the distance from the center of the chuck to the front of the column. 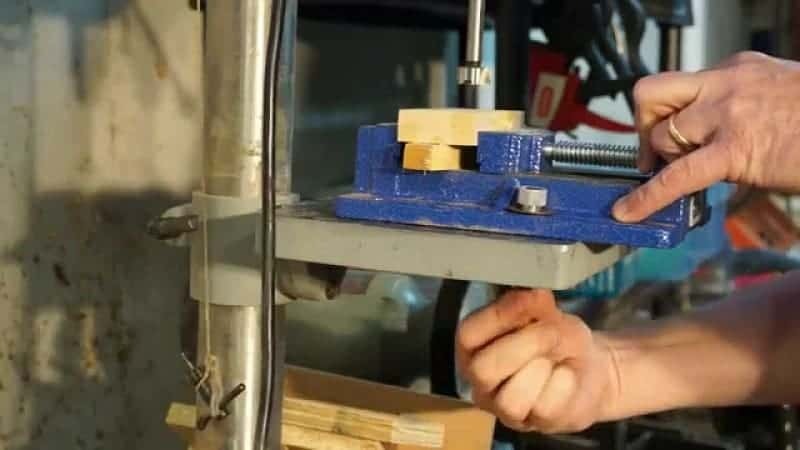 A real life example means that a 16 ½ inch drill press is able to drill a hole through the center of a piece of material that is 16 ½ inches in diameter. Taking this further, if 16 ½ inch is the diameter, the actual distance from the center of the chuck to the front of the column will be 8 ¼ inches. 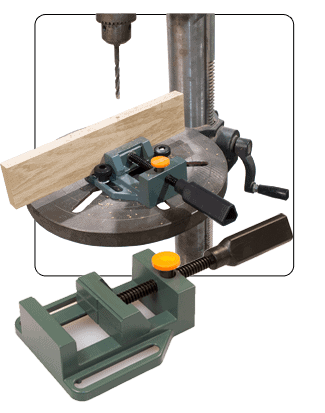 Most floor drill presses that are suitable for the home workshop have a range from 8 to 17 inches.